I spent part of the day watching the sunrise from Eastham and the sunset at Frodsham. There were plenty of Tufted Duck and Common Shelduck on the River Weaver with smaller numbers of Eurasian Teal, Mallard, Gadwall and Goldeneye. There were several Little Grebe and a single Great Crested noted. Pairs of Oystercatcher were claiming their territory along the river and 8 Ringed Plover bunched together. No.1 tank had c300 Canada Goose and then all flew out to the river to their roost. There were hundreds of gulls streaming along the Weaver estuary before dropping on to the Mersey estuary where Black-tailed Godwit, Curlew, Redshank, Dunlin, Oystercatcher, Lapwing and Cormorant sitting on the sandbanks. A Brown Hare made its way across the fields as the light faded and Raven headed south again to their Welsh homeland roost. A couple of hours after work was enough to take time, relax and do some birding. A look over No.6 tank featured c70 Northern Shoveler, 26 Common Shelduck, c100 Eurasian Teal, 31 Mallard and a small flock of Tufted Duck. A small skein of Pink-footed Goose ventured out from Frodsham Score but quickly returned there. I didn’t really attempt to count the Raven flocks this evening but I did manage to glance up every now and again and managed a respectable 148 birds but obviously others went uncounted. Three Marsh Harrier were about and the ringtail Hen Harrier left it until sunset before it made an appearance. Other raptors on show included two Sparrowhawk, Kestrel, several Common Buzzard and the big female Peregrine back on her lofty watch tower high above the Weaver estuary. The Whooper Swan herd was again soaking up the rays in fields beyond the blue slurry tank on Lordship Marsh. I left work after 4.00 pm with a renewed effort to give the exodus of Raven which leave their feeding grounds to spend the night in north-east Wales. Soon after my arrival the first bird of the watch cronked its way overhead. 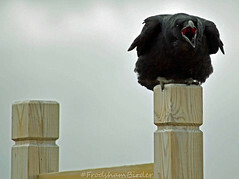 With my elevated position it was possible to see birds from a 360 degree angle. I was hoping to beat my previous count from earlier in the month but I wasn’t expecting to give it a sound thrashing with my last Raven flying south on its lonesome at 18.15 hrs no.304! The waters of No.6 tank were much livelier than yesterday’s WeBs count with 54 Northern Shoveler, 12 Tufted Duck, 21 Common Shelduck, 210 Eurasian Teal, 41 Mallard and 2 Eurasian Wigeon. The ringtail Hen Harrier which usually makes a brief appearance was on show for most of the evening. There were 3 Marsh Harrier coming in very late in the day. A singing Chiffchaff and Cetti’s Warbler were good compensation between dragging my eyes of the corvids streaming overhead. The Whooper Swan herd was much reduced with just 16 birds in fields by the blue slurry tank. I started at Ince today where 38 Curlew and a flock of Rook were feeding on the fields along Kinsey Lane. Duck numbers were low on the pools but Tufted Duck, Mallard, Gadwall, Eurasian Teal and a single Wigeon were all present alongside 3 Little Grebe and 1 Little Egret. There were two skeins of Pink-footed Goose passed overhead and tallied 28 birds. On to the Manchester Ship Canal path with more Tufted Duck and Gadwall on the canal with 3 Mute Swan and several Canada Goose. A flock of c200 Stock Dove fed at the edge of the salt marsh and 2 Great Egret could be seen in the distance. 30 Mute Swan and 7 Greylag Goose were in the field alongside the Holpool Gutter. A Marsh Harrier was over No.4 tank. Rook were inspecting last years nests at the Growhow Works sight and a Great Spotted Woodpecker was close by. A pair of Treecreeper were in dispute in the trees alongside the service road, the first I have seen in the area. A Peregrine was seen over the Gowy Meadows as I made my way home. Observer: Paul Ralston (images 2-7). This weekend is WeBs counting day and I took a hike out to Frodsham Score beforehand. Walking along Lordship Lane and 23 Whooper Swan were still lingering in the fields by Hillview Farm with unseen Pink-footed Goose skeins heard from the same fields. A pale morph Common Buzzard was perched up on a bush on the banks of No.6 tank. A pair of Stonechat were active along the lane. Sat on the banks and looking out to the misty salt marshes I could see 5 Great Egret, small skeins of Pink-footed Goose and small flocks of Golden Plover. I could see Shaun H making his way along the side of the Manchester Ship Canal on his long slog to complete his count from the banks of Frodsham Score. He saw 6 Great Egret and a ringtail Hen Harrier. Whilst I was sat on the bank a singing Chiffchaff heralded the unseasonal Spring weather, while 2 Cetti’s Warbler could heard along the track on No.4 tank. My count on No.6 tank revealed a dramatic reduction in the numbers of Eurasian Teal on the flooded daisy beds with just 114 birds present. There were 54 Shoveler, 21 Tufted Duck, 13 Mallard, 8 Coot and a single Grey Heron. Upto 5 Stonechat were on No.5 tank with a displaying male. Observers: JS & WSM (images 8-11). 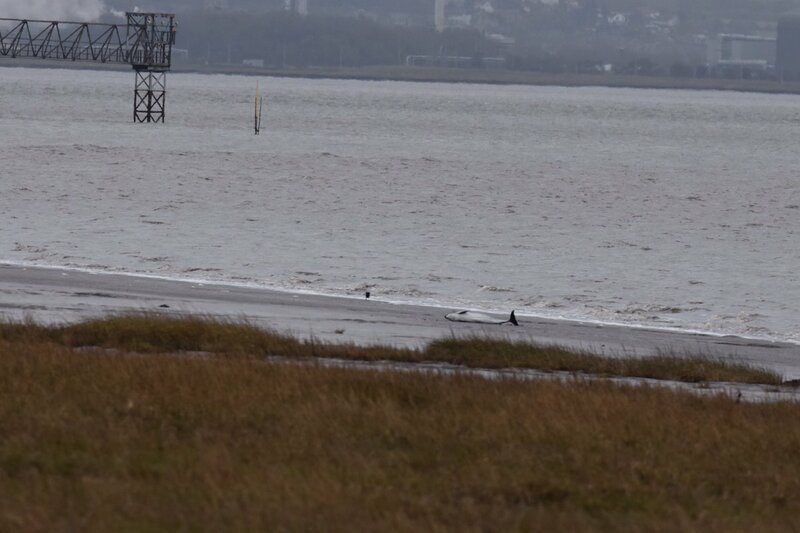 Image 1 by Shaun Hickey shows where the Gowy meets the Mersey at Stanlow Point. I watched the high tide from the Weaver junction today and there were plenty of Canada Goose on the River Weaver with good numbers of Eurasian Teal, Tufted Duck, Common Shelduck, Common Pochard, Mallard and a few Goldeneye. The Weaver estuary had the first ten returning Ringed Plover to the marshes proper. Also seen were several Redshank, Oystercatcher and a single Common Sandpiper were hanging out on the river bank. Raven were again abundant and feeding on the casualties of the weeks exceptionally tide tides, tidying up the excess were several Common Buzzard. Out on the salt marshes were Golden Plover, Curlew, Redshank, 130 Black-tailed Godwit and Dunlin all sat while the tide rolled in. A flock of 9 Avocet flew down river and were clearly the first spring migrants to add a flair of elegance. Walking back along Brook Furlong Lane and a small party of Redwing were foraging in the hawthorns, while a pair of Bullfinch were noted. Two Small Tortoiseshell were out basking in the sunshine. I finished work early and made my way to the marsh for the big high tide. Starting off at Ince Berth where skeins of Pink-footed Goose were seen to be forced off by the tide leaving and heading inland. A Great Egret was in the field alongside the Mute Swan herd and their attendant Greylag companions. Several hundred Curlew were resting in the field with the mute swan herd. Another 4 Great Egret were on the salt marsh with several Little Egret and Grey Heron. Waders were in good numbers and put on a great display as the tide came in and put Lapwing, Dunlin, Redshank, Ruff, Curlew, Oystercatcher and Golden Plover were all noted. The first butterfly of the year made its way along the canal path a bright yellow Brimstone followed by 3 Small Tortoiseshell. A raft of c80 Tufted Duck were on the Manchester Ship Canal with several Mallard and Gadwall. A contract worker on top of one of the turbines had a grandstand view of the area on this bright clear day and a Marsh Harrier was high up over No.4 tank and drifted out to the Frodsham Score its tatty wings and trailing leg having equally good views. A Sparrowhawk the first of 3 birds seen forced a few hundred Starling in to a bait ball and made a couple of fruitless strikes. Common Buzzard and Raven were enjoying the warm sunny bright Spring weather and were displaying over the marshes. No.6 tank was quiet with a reduced amount of wildfowl but still held Eurasian Teal, Mallard, Shoveler, Tufted Duck and Gadwall. 2 male and a female Stonechat were on No.3 with another pair seen on Lordship Lane. The Whooper Swan herd could be seen in the distance near the M56 on Lordship Marsh and 2 Kestrel were hunting the banks on No.4 tank. Observer: Paul Ralston (images 1-11). With the lovely weather bathing the area it was with some expectation I made the pilgrimage to the marsh after work. Walking along Lordship Lane I bumped into Duncan Cowley and we both kept a vigil for the shortie that has been seen recently but on this occasion with draw a blank. A quick pause at Frodsham Swing bridge and its flooded pool harbouring a small Black-tailed Godwit flock and then on down to spend some time on Frodsham Marsh. A harrier flipped over the south bank of No.6 tank in the half-light and revealed itself to be the ringtail Hen Harrier. I was making an effort to count the Raven pairs leaving the outer marshes for their evening roost flight to north-east Wales. I managed my last bird (160) in the ambient glow of the industrial lights of this area. The watch ended when a small bat spp was fluttering about my head by the ramp track to No.5 tank. A 12 km stretch of the legs around the marshes today was required after a weekend of work and an opportunity to polish off my Mersey WeBs count to boot. We arrived on No.6 tank before the high tide out on the Mersey estuary and the count was a little below what I had expected, but counts are counts and wildfowl don’t always conform to expectations. The Eurasian Teal were knocking on the 1000 plus door last week and today I estimated c450 birds. The majority of the flock were remaining concealed in the vegetation and were reluctant to leave it. A small flotilla of 8 Tufted Duck, 3 drake Common Pochard, 21 Northern Shoveler, 18 Common Shelduck and 37 Mallard were the other species present. The only wader was a single Common Snipe and the only raptors was one each of Sparrowhawk and a Marsh Harrier floating over the reed beds. We continued walk and found our first 3 of 13 Stonechat encountered today. A huge flock of c1000 Lapwing high over the Weaver Sluices had c500 Golden Plover leading them along. The ebbing tide out on the Mersey estuary had deposited plenty of Pink-footed Goose feeding alongside Canada Goose herds on the salt marshes. Another skein of 280 dropped into the distant Gowy Meadows. A single Great Egret was joined by 3 Little Egret on hiding in the rougher grassy areas. Alongside the outer marshes is the Manchester Ship Canal and its long finger of water had 82 Tufted Duck, 32 Gadwall and 7 Mute Swan on it. Another Great Egret was in the Ince Marsh fields along with 36 Mute Swan and 300 Curlew. ..finally, the Fox had enough of this intrusion and walked away with its dignity in tatters. The Whooper Swan herd was again hiding behind the hedges in the far fields beyond the blue slurry tank. Observers: JS & WSM (images & video). 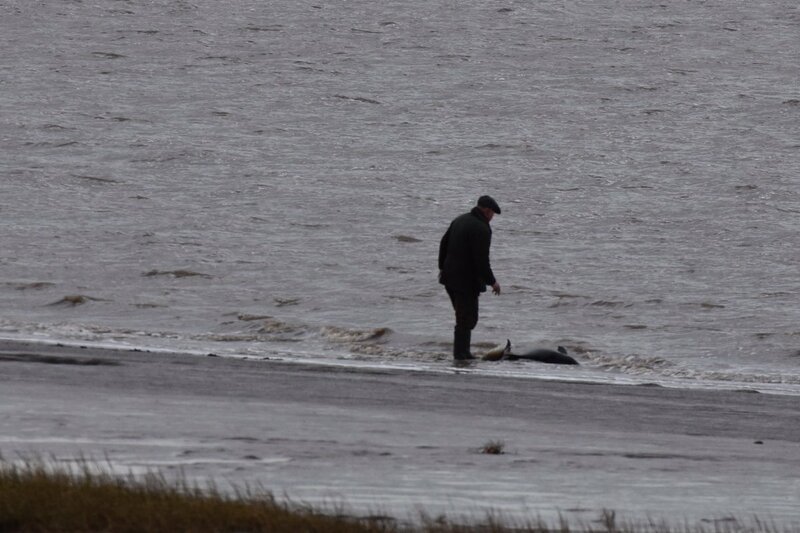 On the other side of the River Mersey at lunch time a Harbour Porpoise was stranded on the shoreline at Garston, Liverpool. 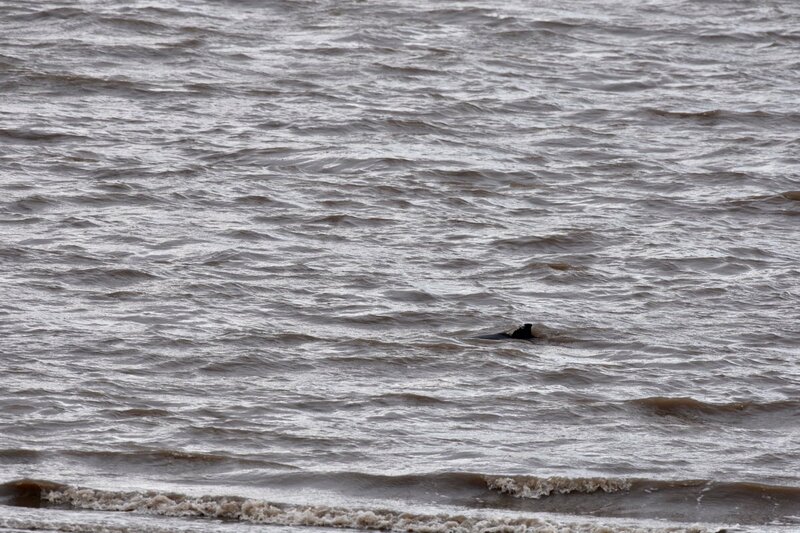 A quick thinking dog walker came to the rescue of this rare (to the Mersey) cetacean and managed to get it refloated. 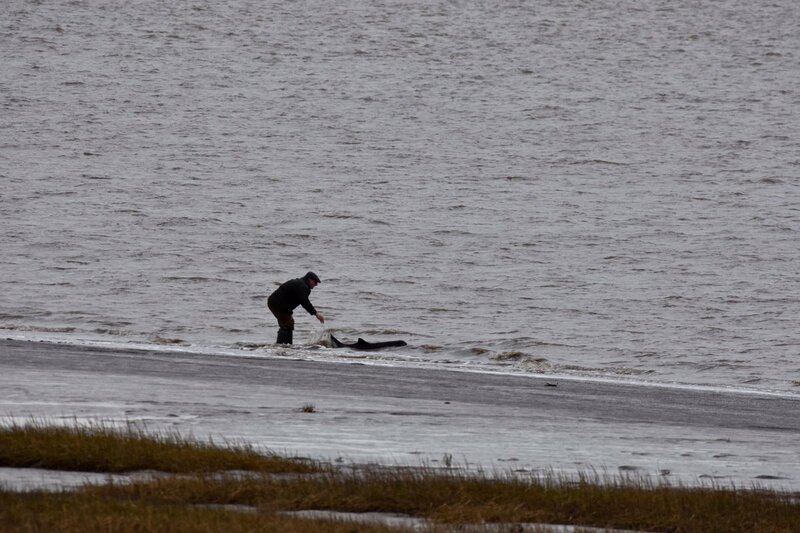 A big thanks to @birderjack for her images taken of the rescue and obviously to the unknown hero for his helping hand.